Visit jbpritzker.com and brucerauner.com to volunteer. Other gubernatorial candidates include Kash Jackson (L), William Kelly (Constitution Party), and Sam McCann (Conservative Party). Due to limited space, we can only include candidates who poll 15% or higher, but encourage you to check out their websites. Due to limited space, we can only include responses if candidates poll over 15%, but encourage you to check out his website. To download a printable pdf version of this guide, click here. Rauner – Mixed. Signed bill to expand and protect abortion coverage. Personally pro-choice, but respects religious and moral objections, supports “pro-life” candidates. Campaign Finance: Support Citizens United decision, allowing unlimited political donations from corporations and unions? Pritzker – No. Wants to overturn it, and strengthen Illinois campaign finance laws. Pritzker – Yes. Considers it “a real threat,” wants to move Illinois toward 100% renewable energy. Rauner – No public statements. Climate Change: Should the government limit the levels of greenhouse gases in the atmosphere? Pritzker – Yes. Supports participation in U.S. Climate Alliance, a coalition of states committed to climate change action. Rauner – No. Relax emission limits in order to save IL coal-fired power plants. Has not joined Climate Alliance. Rauner – Has stated his priority to fully fund K-12 but cut funding several times to balance state budget. Current plan increases funds but also shifts debt burdens such as pensions from state to schools. Pritzker – No. Will invest in public education & oppose vouchers & charter school expansion. Rauner – Yes. Signed bill protecting school choice for parents, including more charter school funding & more access to private schools through tax credit scholarships. Pritzker – Yes. Need sustained, long-term investment to attract students and businesses dependent on well-educated workforce. 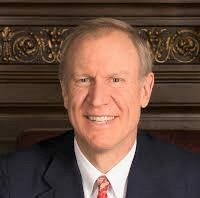 Rauner – Yes. But vetoed funding bill that he considered an irresponsible way to fund higher education. Rauner – In 2014 said he would have vetoed recently-passed state marriage equality bill, but accepts gay marriage as settled law since 2015 Supreme Court ruling. Pritzker – Yes. Gun violence is “a public health epidemic.” Supports banning assault weapons, bump stocks, and high capacity magazines; requiring gun licensing; and implementing universal background checks. Rauner – Mixed. Supports some restrictions on access for criminals and the mentally ill, and ban of bump stocks. But vetoed bill on state licensing of gun sellers. Healthcare: Support or Repeal the Affordable Care Act (ACA), known as Obamacare? Accept ACA’s Medicaid expansion to subsidize low-income participants? Pritzker – Yes. Support ACA; expand Medicaid. Rauner – Mixed. Did not publicly oppose repeal, although said expressed concerns privately. In 2014 opposed Medicaid expansion; now wants to move more Medicaid recipients to managed care programs. Rauner – Yes. Supports concept of a work requirement. Immigration: Support path to citizenship for America’s 11 million illegal immigrants, including “DACA” recipients or “Dreamers,” who grew up in the US after being brought here as children? Rauner – Mixed. Wants to see “comprehensive immigration reform at the federal level” but has dropped earlier support for a pathway to citizenship. Says DACA is up to Congress. Labor: Support “right to work” law, eliminating the right of unions to mandate dues for workers they represent? Rauner – Yes. Has historically opposed required dues for public unions. Supports allowing cities and counties to declare themselves “right to work” zones. Rauner – No to legalization. Signed bill to decriminalize small amounts. Pritzker – Yes. Favors raise to $15. Rauner – No. Vetoed bill to raise to $15 in 4 years. Renewable Energy: Government support for renewable energy? Pritzker – Supports increasing requirements for the percentage of renewable energy produced by utilities. Taxes: Support President Trump’s tax cuts? Increase or cut taxes on high-income Illinois earners. 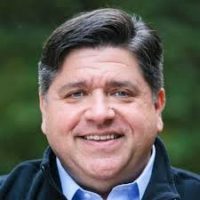 Pritzker – Opposes Trump tax cuts. Would raise IL taxes on higher-income earners. Rauner – Supports Trump tax cuts. Opposes taxing Il higher-income earners. Pritzker – No. Running mate supports process to expand voting rights of prisoners who haven’t yet been convicted. Rauner – No. But vetoed legislation that would have expanded rights to prisoners who haven’t yet been convicted.